Hire with Ease: With us, sourcing international talent becomes as easy as recruiting in your local market. 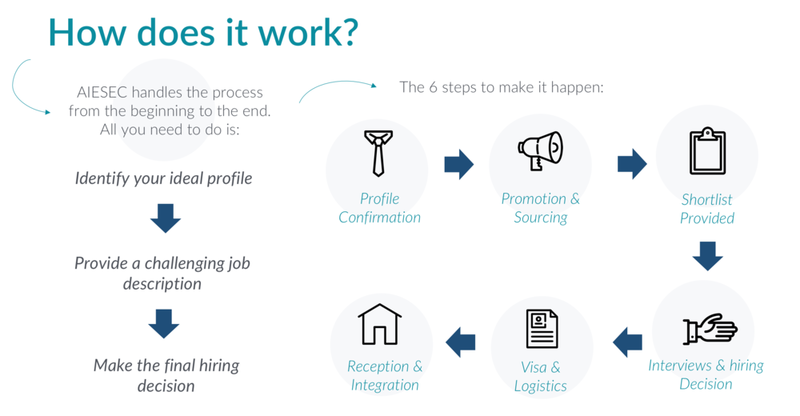 We customize our recruitment process to make it easy for you to hire global talent. Talent Acquisition: Behind every successful company that innovates is a diverse global workforce. Bring interns from all around the world to ensure global input in your business operations. Infuse your business with the fresh perspective of Millennials from around the world. Stay Competitive: Stay dynamic by bringing in profiles aligned to what the market needs and demands; minimize the skillgap. All around the world, our product attracts talent of diverse backgrounds: HR, marketing, engineering, software development, education, sales and many more. Boost Your Work Culture: Millennials are bound to dominate our global workforce. Adapt your business to new trends and become millennial-friendly. Our partners have always loved the energy and flair that our interns bring to their workplace while also contributing to a dynamic environment.